Philosophy Field Course: Friends of Clayoquot Sound (part 1) - Do trees have rights like people? The slideshow opened with a presentation by Joe Martin, a Nuu-Chah-Nulth spokesperson. He shared a traditional song with the audience and expressed his concerns over industrial activity in the area. This was followed by images of variable retention logging as it is currently practiced in certain regions of Clayoquot. These were contrasted with other images of pristine, unlogged forests and their inhabitants. 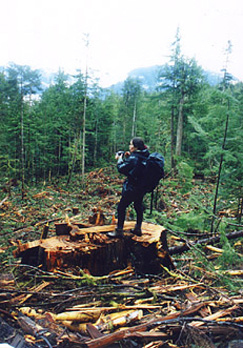 I gather that the intended message was to illustrate the damage caused by these logging practices. It was even suggested that they differ little in their impact from old-style clear cutting. Initially, I had the predictable sort of reaction to these images. But on refection I am led to question this response. It is possible that variable retention logging has a relatively minor impact over the long term. To decide this matter one would require other sorts of evidence besides evocative photos. The slideshow seemed geared more towards mustering public sentiment than documenting scientifically grounded facts. Perhaps this approach is justified in a presentation tailored for the general public. But personally I would prefer to see the level of debate raised up a few notches. Some scientific evidence, even a few citations, would make for a stronger case – if only to communicate to the audience that The Friends are basing their own case on solid grounds. Environmentalists often prefer the strong punch-line over reasoned argument, and in my view this is unfortunate. In fact, the general impression of our group is that the average Tofino resident possesses a fairly sophisticated understanding of these issues, certainly more detailed than what was presented in this slideshow. Another interesting message was that despite Clayoquot Sound’s designation as a UNESCO Biosphere reserve, the area is not legally protected. The Friends are concerned to dispel any public misconceptions about what this designation entails. During the Secrets of Clayoquot Sound presentation we were treated to this protest video. Enjoy! What then is The Friends' vision for Clayoquot's future? My sense is that they would like to see the removal of all fish farms in the Sound and a moratorium against any logging in old growth watersheds. This raised several questions for our group, mainly concerning the economic and social implications. How many people depend, directly or indirectly, on these industries? What would happen to the community if they were to disappear? And how would one justify this outcome to community members? 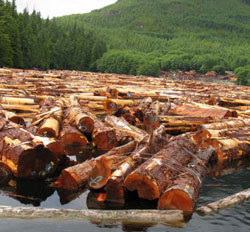 In response, Dan argued that the damage caused by these industries to Clayoquot Sound is inherently unethical. On this view, the loss of old growth is morally objectionable because these forests have intrinsic worth akin, perhaps, to the worth of a person. It would be immoral to condone any industry that harms people, regardless of the social and economic benefits. According to Dan, the same implication holds for the destruction of old growth forests. While I understand this sentiment, there are problems with the idea that forests are valuable in this strong, moral sense. To place them on par with human life, or even human welfare, requires further argument. What justifies the idea that forests matter more than people? One can certainly empathize with those who depend on industry for their livelihood. If people in this region are benefitting from fish farming and logging, and if this does not result in the utter destruction of old growth forests, then I can see how these activities might be tolerated in the name of human welfare. Of course, Dan Lewis might respond to this point by saying that people do not have an inherent right to live and flourish in this region. Europeans originally moved here to attain personal wealth. Now their descendants have come to expect as much, viewing it as their right to demand a high standard of living and indefinitely many opportunities. What justifies THAT attitude, he might ask. I am not sure how to respond to this challenge so instead I will accept, for the sake of argument, that economic opportunities are not an entitlement. If a high standard of living is what one wants, then perhaps it is best to search elsewhere - or else accept a more modest standard of living. I have a more difficult time extending this to First Nations. Their ancestors did not arrive here with the ambition of personal wealth. These are their traditional lands to manage. First Nations communities alsoe have the most to benefit from industrial development. Currently, the standard of living in many of these communities is unacceptable. These individuals have a right to develop the region as they see fit in order to improve their well being. In fact this is an issue I want to address in a separate blog post. The cozy relationship that once existed between environmentalists and First Nations has eroded in recent years. Environmentalists now find themselves in a new political environment and it is unclear how they are going to adapt. In the mean time let me try to summarize the current line of thinking. I have attempted to reconstruct part of our exchange with Dan Lewis. His organization values pristine wilderness as an end in itself. The destruction of this wilderness is seen as a moral evil. So any economic development is by extension immoral, on this view, no matter whom it benefits. But this is a big assumption. Not everyone values pristine forests over human welfare and I see no reason why they must. Arguably the destruction of some pristine forest is an acceptable trade-off for a high standard of living. But one might also call THIS value into question. What entitles the current occupants of Clayoquot to a high standard of living? Perhaps those who desire wealth should seek it elsewhere. An interesting complexity however is that not all of Clayoquot's inhabitants share the same entitlements. It strikes me that the aboriginal occupants of this region enjoy a privileged position in deciding how it is developed.